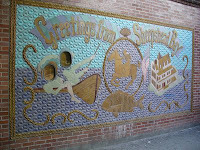 I am sort of settling in my new place in Sheepshead Bay, Brooklyn. It is nice to be walking distance from a church, a major (B and Q lines) subway station, my bank, and at least 2 major supermarkets. For now, I have home internet access. I finally checked the site where I e-filed my NY and Federal taxes 2 months ago, and found out that- surprise- my state return never got filed. I got billed April 2 for filing a nonexistent return. I am in the process of closing out my storage site. This means I don't have to travel to Long Island City to access my CDs, my photo albums, and diaries dating back to 1987. And since I don't have anywhere near the short-term memory I had in 1987, I need those diaries to reference things such as when I filed my taxes, when I last dated, old immunization records, old school attendance dates, and certain old debts (see the next paragraph). I still don't have such niceties as a camera phone,a microwave oven, a DVD player, an antenna that allows my DTV converter to pick up such stations as WNET, WLIW, and WPXN, and I still don't understand that Twitter thing that Lane Gold and several others are so adamant about. Speaking of Lane, he finally joined Blogger with a horse blog. I'm sure that a lot of people are wondering what the hell is going on with the Triple Crown race circuit. 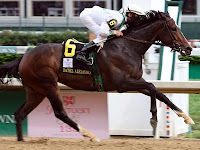 Between a longshot Derby winner called Mine that Bird, the Preakness and Kentucky Oaks winner Rachel Alexandra, their usual jockey Calvin Borel, and allegations of collusion to prevent certain fillies from entering the Preakness, the whole mess is resembling an equine version of the Jerry Springer show. And to think, if that scumbag Spitzer hadn't tampered with NYRA's business 3 years ago, I might still be working certain promotions at the tracks. But the amount that Lane still owes me from a certain tow job in Queens back in July 1991 might just barely cover a decent seat at the Belmont Stakes next month.